The Horsehead Nebula (also known as Barnard 33 ) is a dark nebula in the constellation Orion. The nebula is located just to the south of the star Alnitak, on Orion's Belt, and is part of the much larger Orion Molecular Cloud Complex. The nebula was first recorded in 1888 by Scottish astronomer Williamina Fleming on photographic plate B2312 taken at the Harvard College Observatory. 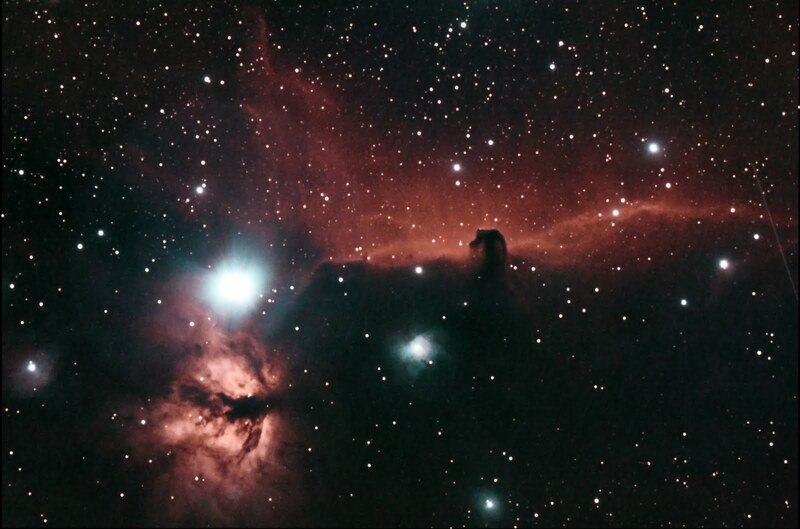 The Horsehead Nebula is approximately 1500 light years from Earth. It is one of the most identifiable nebulae because of the shape of its swirling cloud of dark dust and gases, which bears some resemblance to a horse's head when viewed from Earth. 34 x 150 sec at ISO 1600, no Darks. 100mm APO telescope, with 0.85 reducer/flattener and Canon 600D astromodified Camera.